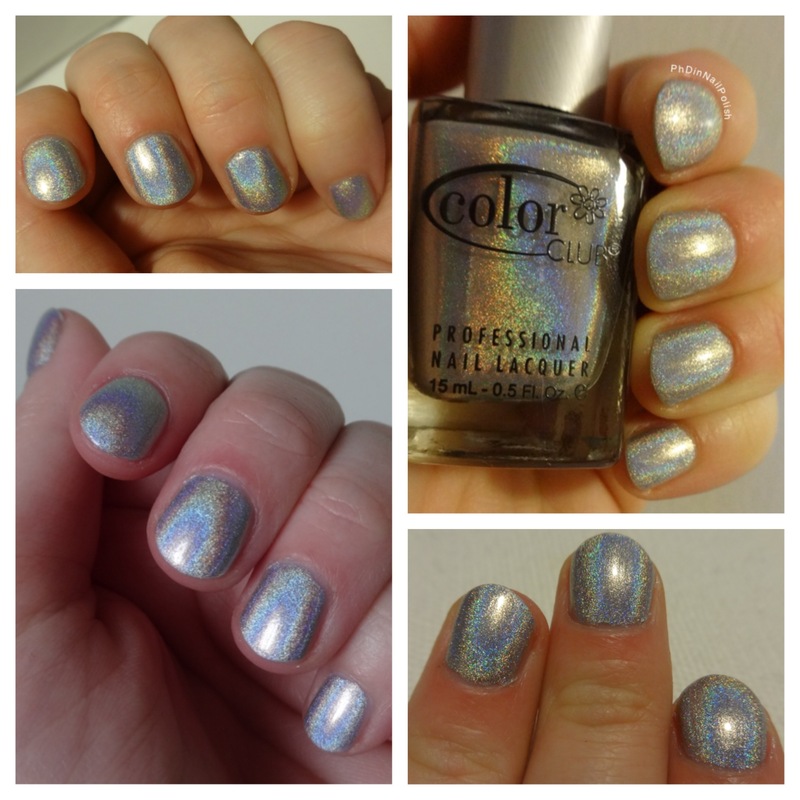 Today I’ve got “Harp on It”, a light gray-silver holo from the Color Club Halo Hues collection. 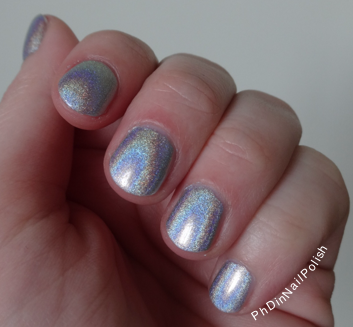 This was the first holographic nail polish that I bought, so I can safely say that this is the one that started my obsession (shortly afterwards I purchased Colors by Llarowe Dirty Diana, which sealed my fate for holos forever). This has a nice light color, leaning ever so slightly blue-ish (that could just be my translucent skin tone). If you’re pale like me and looking for a nice subtle silver, I say this is your guy! The formula is fantastic and easy to work with: it dries super speedy, and the holographic effect hides any mistakes. “Harp on It” is opaque in two coats, which is what you see here. It is sparkly, but the finish when it dries isn’t glassy and shiny, so I went with top coat. I have to say that this is one of my top five favorite polishes. On days when I can’t decide, I default to this color (it is currently on my toes!). I love that the holo is just as strong in dim interiors as it is out in the sun (there should be a line of polishes especially for house hermits). It also works well for stamping, since it is very opaque. You can get this polish from the Color Club website for $10. I bought it a few months ago from Llarowe for $8. I’m not really why there’s a discrepancy in price, so I suggest that you look around if you’re thinking of purchasing it (do it. buy it.). As added bonus content, if you would like to see a video of “Harp on It” in motion, check out my Instagram.